The royal-themed Crowning Glory slot has 20 paylines over 5 reels of 3 rows in a fairly typical format for a game of this type. 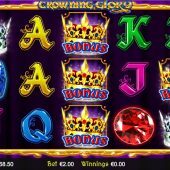 Developed by gaming company Betdigital, Crowning Glory is available online via PC, tablet and mobile devices. However, is probably best enjoyed on the latter as that is what it appears to have been designed for. The Theoretical RTP (return to player) for this slot is 96.41% and it is considered to be a low to medium volatility slot. By triggering the bonus feature in this game you can activate 8+ free spins with 1x extra multipliers. Other slots that fall into the same 'theme' category at Crowning Glory include Royal Spins from IGT and Barcrest's classic Crown Jewels slot. There is also Gold King from Play'n Go, which also includes a 'King' as a central character to the game.